NFL Network's Thursday night broadcasts are studies in contrasts: Brad Nessler's rock-solid game call accompanies Mike Mayock's best-in-the-business analysis, and then they send it to a studio panel where Rich Eisen tries (and usually fails) to wrangle his motley crew of screaming fools. Steve Mariucci tends to be the straight man amongst the panel's jokers, though the former 49ers and Lions coach isn't totally square. 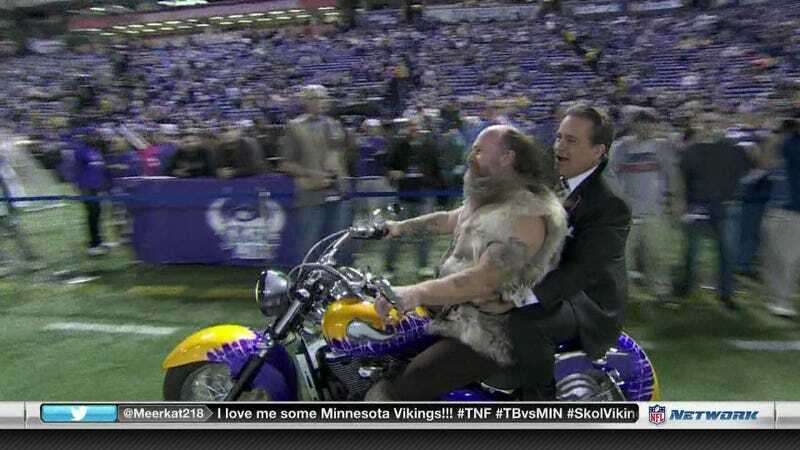 Before last night's Bucs-Vikings bout at the Metrodome, Mariucci hopped abord Ragnar's chopper, an ominous moment for the man suggested to be a strong candidate for replacing Bobby Petrino at Arkansas.